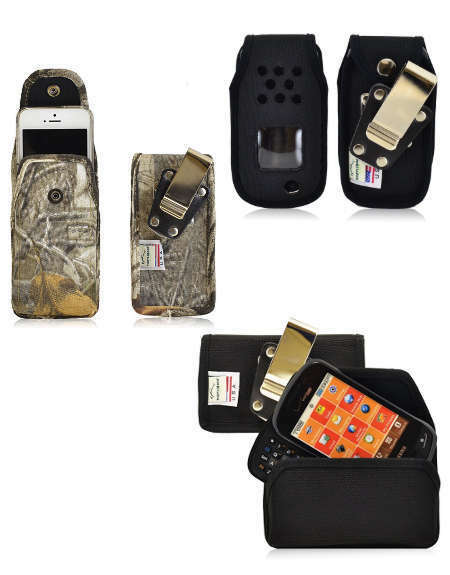 We offer a variety of heavy duty cell phone cases for smartphone, iPhones, Android Phones, cell phones - whatever your mobile device. Tough, rugged cases that stand up the day to day challenges you face. We have heavy duty cases by Rugged Equipment, TurtleBack, Otterbox, C5, Ballastic and others. What Makes These Cases Rugged? Brands like Turtleback & Rugged Equipment use a tough Ballistic or Cordura Nylon to manufacture their phone cases and pouches. They also come with heavy duty metal belt clip or tough belt loops. Otterbox and Ballistic use hard plastic and soft silicone shells to protect your device. Belt Loop Turtle Back Heavy Duty Cases. Fits belts up to 2 7/8 inches. This Ultimate, Durable Leather Belt Loop with Metal Clip which will fit all Turtleback Heavy Duty Cases. Belt Loop Fits 2 7/8" Wide Belts.